Novelist E.W. 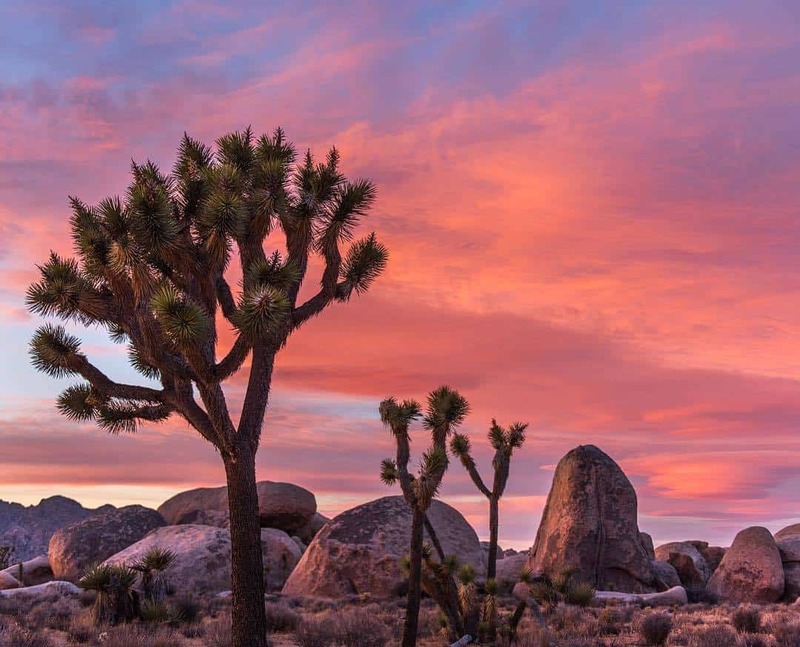 Howe was spot on when he said, “The feeling of sleepiness when you are not in bed, and can’t get there, is the meanest feeling in the world.” Yes, camping is all about being close to nature and exploring the great outdoors. But, where does it say that the adventure must be without comfort? TETON Sports Outfitter XXL $100+ 85" L x 45" W x 19" H Up to 600 lbs. Coleman Pack-Away Cot < $50 72" L x 33" W x 24" H Up to 300 lbs. Coleman ComfortSmart Cot $50 - 100 69" L x 25" W x 15" H Up to 275 lbs. Coleman ComfortSmart Deluxe Cot $50 - 100 80" L x 30" W x 15' H Up to 300 lbs. It is true that no camping gear can match the comfort of your home. Well, if it did, people would buy gear instead of building houses, right? 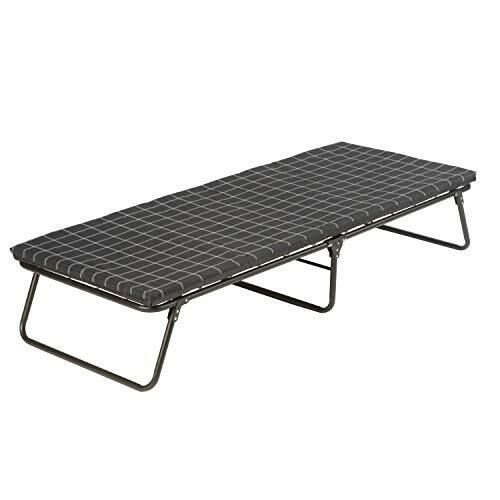 However, a good camping cot can give you a sleeping experience that’s close to home. After all, camping is about rest and recreation as well. So, investing money in a camping cot is quite as important as investing in other essential camping gear. Fortunately, in the next few sections, we will go through the top camping cots in the market across different customer profiles. And if you want to explore beyond the products here, the buying guide will teach you a simple four-step process to make a good purchase. 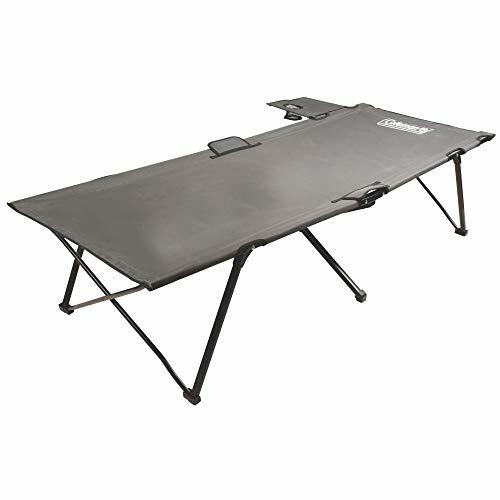 If you’re ready to add a camping cot to your gear, let’s go to the camping cot reviews. Extruded aluminum frame and reinforced steel S-leg assembly enhances durability and load capacity without adding weight. The Outfitter XXL comfortably bears loads up to 600 pounds. It can accommodate people as tall as 6 ft. and 10 in. The length of the sleeping area equals that of a queen-sized bed. The width equals that of a twin-sized bed. Sleeping area is extremely spacious for one person. In fact, if you don’t mind a little crowding, you can squeeze in another person. At 26 pounds, this camping cot is rather light for its size. When folded, the camping cot requires a 3.5 ft. x 1 ft. x 0.6 ft. space for storage or transport. TETON Sports offers a lifetime guarantee on the Outfitter XXL against material and workmanship defects. If you’re looking for a product that offers the best long-term value for money, this is the product for you. Although the Outfitter XXL is our top pick, paying around a hundred dollars for a camping cot may not be within everyone’s budget — or reason. For those who like to finely balance the price to utility equation, we bring you the Coleman Pack-Away Cot. Since value for money is the Pack-Away’s main selling point, let’s see what you get for this product’s $80 price tag. Although the Pack-Away costs only half as much as the Outfitter XXL does, the available sleeping area is nearly the same. This cot can bear loads up to 300 pounds, and is a good fit for people as tall as 6 ft. and 6 in. But, unlike the Outfitter, which can host two people if you absolutely had to, the Pack-Away is suitable only for single-person use. Weight only 7 pounds, there are no camping cots that are as light, yet as durable, as the Pack-Away. When folded, this cot requires only half the space the Outfitter needs. However, this product comes with a one-year warranty against material and workmanship defects. If you’re looking for the best deal for your money, go for the Coleman Pack-Away cot. If you’re under 5 ft. 7 in. tall, and weigh less than 275 pounds, the sleeping space on the ComfortSmart is enough. If you don’t need the extra space, why pay extra for a large-sized cot like the Outfitter XXL or the Coleman Pack-Away. 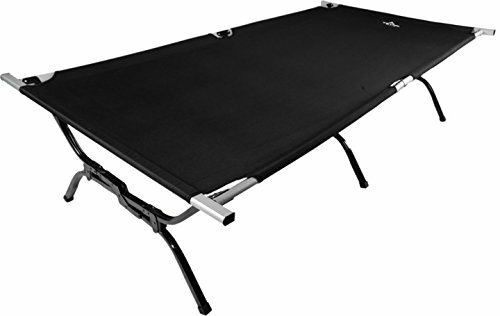 Unlike other camping cots we discussed previously, the ComfortSmart comes with a thick foam mattress and a spring coil suspension. So, you won’t have to lug around a mattress for your cot. Despite the mattress, the cot weighs just 14 pounds and you can fold it for transport or storage. When folded, the cot is about 2.8 ft. x 2 ft. x 0.45 ft. Even though the product is a low-cost model, Coleman offers a one year warranty on the product. That’s a great deal on a cot this cheap. So, if you’re looking for a cot that’s not ideal, but will get the job done, then you should go for the Coleman comfort cot. 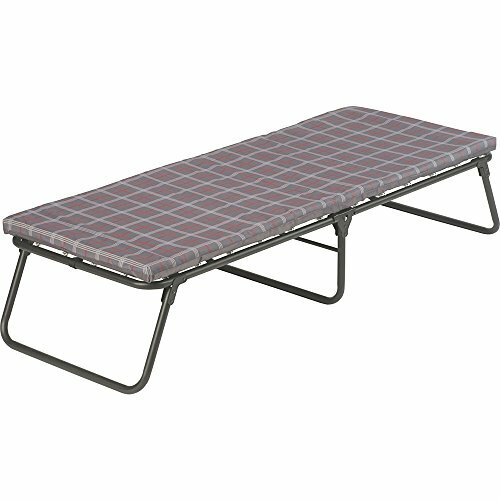 Unlike TETON Sports, which has products only in the high price bracket, Coleman has cots in every price range. Plus, Coleman products are high quality. That’s why many the products in this section are from Coleman. So, we thought to include Coleman’s answer to the TETON Outfitter – the Coleman ComfortSmart Deluxe. The ComfortSmart Deluxe is a bigger version of our budget pick, the ComfortSmart. The deluxe cot’s sleeping area measures 78 ft. x 28 ft. The sleeping space leaves enough room for people as tall as 6 ft. 6 in. It can also bear loads up to 300 pounds. So, if you’re looking for a single-person cot, the ComfortSmart Deluxe will serve you perfectly. Like the ComfortSmart, the ComfortSmart Deluxe also comes with a thick foam mattress and a spring coil suspension. The cot weighs close to 20 pounds. When you fold it, it measures approximately 3.25 ft. x 2.5 ft. x 0.46 ft. So, it is less compact than the TETON Outfitter. Considering all this, this cot isn’t a great buy for the price. However, the reason this isn’t out top pick is the warranty. Even though you’re paying two times more for the deluxe model, you still get a warranty of just one year. If the warranty on the product were better, this would have been out top pick. Selecting the right camping cot from the numerous choices available isn’t easy. The fact that companies project qualitative parameters, not quantitative parameters, don’t make things any easier. After all, what does “comfortable” or “durable” mean anyway? So, we’ve made a buyer’s guide that will take you through measurable considerations that go into buying a good camping cot. So, let’s begin with the first factor – you. First, measure your height and weight. Then, measure the width you need to sleep comfortably. To do this, lie down on your bed and approximate the minimum width you need to sleep without the risk of falling over. Once you have these measurements, you can go to the next step. Now that you have a real set of yardsticks to compare products, you can use your favorite e-commerce platform to look at all the camping cots on the market and eliminate the ones that are too small for you. Also, make sure the maximum capacity of the camping cot is enough to bear your weight. After eliminating all the products that are not of the right size, you can move on to the next step. Reputation: Look for companies that have a long and solid reputation of manufacturing camping gear. The quality of the company website and the responsiveness of its customer support service is a reliable indicator of the company’s reputation. Material: To minimize cost, companies shortchange the materials used to make camping cots. Such cots don’t last long. You can avoid this by selecting cots made of heavy-duty or reinforced metal. Warranty: The duration of warranty shows the manufacturer’s confidence in its product. For example, TETON Sports offers a lifetime warranty on their products. This means shows that the company is confident that no issues resulting from manufacturing or material defects will arise throughout the product’s lifetime. Cost: Don’t let the market dictate your budget. Go into the game with a clear budget in mind. Although a 10 to 20 percent fluctuation is acceptable, don’t overshoot your budget by more than 40 percent. Weight: Remember, the cot isn’t the only thing you’re taking with you while camping outdoors. So, think about how much weight you can add to your existing gear. Volume: While camping outdoors, space is at a premium. So, the volume of the cot, folded and expanded, is important. Accessories: Sometimes, you can attach accessories to your cot to extend its functionality. Some cots come with free accessories, and in other cases, you have to buy them separately. Thus, you must evaluate the usefulness of the accessories. Now, it’s time to read what existing customers have to say about the product. It’s strange that a lot of people read the reviews before creating the shortlist. Unless you have some background knowledge about the product, you can’t objectively judge a product. But, after shortlisting products, you have enough knowledge to see whether positive reviews are inflated or negative reviews are overly critical. While reading reviews, read both positive and critical reviews. However, don’t let the good stuff distract you from potential flaws. At the same time, you shouldn’t allow the negatives to discourage you from buying the product unless the criticism is warranted, justified, and sensible. If you’ve gone through this process, you can confidently order your product. You’ve done all you can to make sure you’re spending your money on the right product. Now, all you need to do is wait for the delivery. While you’re waiting, you can plan the next outdoor trip to test your awesome new purchase. You’ve had a lot to process. So, before concluding the article, let’s go through what we know. In summary, the best camping cot on the market right now is the TETON Outfitter XXL. It’s more than comfortable for one person. If required, it can accommodate two adults. But, it will be a little crowded. However, this high-end product costs around a hundred dollars. If you’re looking for something in the budget range, then the Coleman ComfortSmart is your best bet. But, we understand that the ComfortSmart may be too small for some people. So, you can choose between the ComfortSmart Deluxe and the Pack-Away. Both models can easily fit people under 6 ft. 6 inches tall and 300 pounds heavy. Over the last few decades, camping gear has come down in price and gone up in utility and durability. This is true for the camping cot as well. Today, there are many high-quality camping cots across various price ranges. So, choosing the right one for your needs can tax your brains heavily. To avoid this, you need a systematic approach to make your buying decision quickly and effortlessly. Hopefully, this buying guide will serve as a good foundation to begin and conclude your search for an amazing camping cot.